V0596. VOCAL RECORD COLLECTORS' SOCIETY - 1995 Issue, incl. 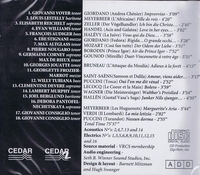 Voyer, Lestelly, Reichelt, Evan Williams, Audiger, Tubiana, Jouatte, Stignani, Altglass, Nougaro, de Rieux, Clementine de Vere, Corney, Lambert Murphy, Joel Berglund, Frozier-Marrot, Pantofel-Nechetskaya & Consiglio. VRCS 1995. Transfers by Seth B. Winner.